Imagine your dream sampler. A sampler that is seamlessly integrated into your computer. No rack space, no MIDI or audio cabling mess, no sample media chaos. Total recall inside each song you do, and a user-friendly archive function. That loads up to 128 instruments at once, 16 of which are simultaneously playable. That lets you assign sounds to 4 stereo, 4 mono and 5.1 surround outputs, giving you a total of 18 outputs. That offers easiest handling thanks to drag & drop, pristine sound quality with 32 Bit/96 kHz support and unrivalled modulation capabilities. That includes a powerful disk streaming engine that allows you to load sample libraries in all common formats (from AKAI through E-MU to GIGA) that are much larger than the RAM available on your system. And has fantastic sounding filters powered by Waldorf. HALion 5 and HALion Sonic 2 treat users to thousands of synthesized and acoustic sounds, dialed in through eight fantastically new instruments: the sleek virtual analog Trium synthesizer, Auron for granular oscillation, Voltage delivers extra punch, World Instruments and World Percussion, HALiotron, the Model C organ emulation and the B-Box step sequencer for beats and drum patterns. Both HALion and HALion Sonic now feature nine new effects including VST Amp for superb guitar and bass effect sounds and Auto Filter for seamless sound morphing. Based on Yamaha’s Motif technology, FlexPhraser offers complex arpeggios, now sporting the user phrase editor to create custom patterns and phrases. In addition, HALion 5 comes with two new sound sources, introducing the granular synthesis engine for creating beautiful sonic textures and the tone-wheel organ simulation with nine organ and percussion drawbars. Also new to HALion is the slicing mode that allows users to adjust audio material to fit any beat or track. Two new MIDI modules feature MIDI Player to load MIDI files that can be edited and triggered remotely. Drum Player is a step sequencer conceived and designed to play drum beats and rhythms. Issue with opening and loading HALion projects in Cubase 7.0.0 resolved. This update introduces true multi-core support. A single HALion instance can now access all CPU cores and make good use of all the power available inside your computer. A new preference on the options page allows you to choose how many cores can be employed by HALion. This is helpful to control the performance available to HALion in order to properly share cores with other applications, such as Cubase or Nuendo. HALion now offers dedicated time-stretching and pitch- shifting functionality based on the AudioWarp algorithms also used in Cubase and Nuendo. There are two different modes for different types of audio material available in the sound editor of a sample layer: a "Solo" mode for solo instruments that allows the correction of formants and a "Music" mode which is optimized for time correction of polyphonic audio material such as drums. through the file structure and preview audio files instantly. There is a search function included in the browser that lets you find your desired sounds with just a few clicks. Additionally, containers like ISO, HSB, VST Sound, GIGA and others can be browsed in the import window immediately. For enriching the sound, the numbers of oscillators used on each oscillator channel can be set to a maximum of eight. By editing the "detune" and the stereo "spread" of the oscillators channel, the sound can be further widened. MIDI modules of the same type (e.g. FlexPhraser) can be edited together if selected. New navigation icons on top of the sound editor. Expression on amp level can now be deactivated. Headroom level for importing samples can be adjusted. To specify a default preset, go to the multi-program save/load drop-down menu above the instrument slot rack and click "Save as default". The new multi-program loading option lets you define whether a multi-program is cleared before loading a new multi-program, or if it is kept in RAM. Drag and drop operations from Cubase 6 to HALion 4 are now possible if the directory name containing the sample includes an umlaut. External MIDI inputs no longer respond only to the first MIDI channel. The "4.0" at the beginning of a quadraphonic program will not be displayed in the Cubase 6 MediaBay. When using the filter envelope as a source, the filter attack now works as expected. Recording MIDI in the standalone version of HALion 4 now works correctly. When playing the first note after initial loading of a project, the volume for programs which use the amp section for zones no longer sounds too loud. The state of lock buttons and selections are maintained when closing and reopening the HALion 4 plug-in window. Volume and Pan MIDI CCs on the same MIDI channel now restore correctly in multi-programs. Changing values via up/down keys works now correctly in non-floating windows. When using key commands for moving zones, the root key no longer jumps to G8. The assignments of modulation modules, e.g. mono LFO, remain fully maintained. When changing values in the modulation matrix with the mouse wheel, unwanted scrolling does not occur. When exiting the HALion 4 standalone application, the exit dialog no longer needs to be clicked twice. The modulation wheel in the HALion 4 user interface now responds to all MIDI channels. In the envelope view the G/H key commands for zooming in/out are no longer interchanged. The "Missing files" dialog can be closed and is no longer displayed twice (Mac OS X only). HALion 4.5 introduces numerous new features and improvements, including multi-core processor support, advanced time-stretching and pitch-shifting algorithms, a new sample file browser and multi-oscillators. 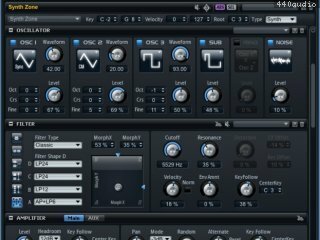 Alongside its comprehensive sampler functionality, HALion 4 now contains the high-class Virtual Analog Synthesizer already known from HALion Sonic. Create razor-sharp leads and evolving pads from scratch and switch over to meticulously layered sample programs, powerful editing tools and sublime sound controls in the sampler section — mutual benefits guaranteed. With its flexible desktop architecture HALion can be adjusted to each phase of your creative process and lets you stay on top of things, even when working on large projects. Designed for the most demanding sound design tasks, HALion 4 lets you resize, move and dock windows, save and recall screen sets, spread windows across multiple monitors, and create tabs for frequently used functions. Simply leave out screen-cluttering elements and build a workspace that is dedicated to your current projects and individual needs. HALion 4 supports the new VST 3.5 standard with all its advantages like VST Expression 2.0, Note Expression and Quick Control integration. With the groundbreaking Note Expression feature, individual note events now contain their own set of controller data when played polyphonically, therefore offering you a whole new creative approach to sound design. With VST Expression Maps, musical articulations and playing styles can be directly controlled during any performance and recording. The advanced HALion 4 version of MegaTrig contains loads of new features and conditions that let you create own playing styles, articulations and conditional triggering easier and faster without page-filling scripting. With plenty predefined conditions that can individually be combined, you can bring your sound to the next level. Turning your vision to reality has never been easier! Based on Yamaha's Motif Technology, the FlexPhraser arpeggiator allows complex instrument patterns. Complete MIDI multi-channel FlexPhrases can be mapped across the keyboard or the virtual drum pads and start an entire inspiring backing just with a single fingertip. Beyond dozens of different arpeggio types, FlexPhraser is the perfect tool for playing complete instrument patterns in sync to the host with a touch of a key! The possibilities are sheer endless! HALion 4 incorporates a state-of-the-art mixing engine with powerful routing options for complete control over your signal flow. There are virtually no restrictions — create an unlimited number of buses per Program and Layer and freely route the signals as desired. Each bus holds controls for level, pan, mute and solo as well as eight insert slots. What's more, HALion 4 features a total of 32 stereo output channels and 6-channel surround support. This way you not only handle complex setups easily, but also create professional mixes without ever leaving HALion 4. 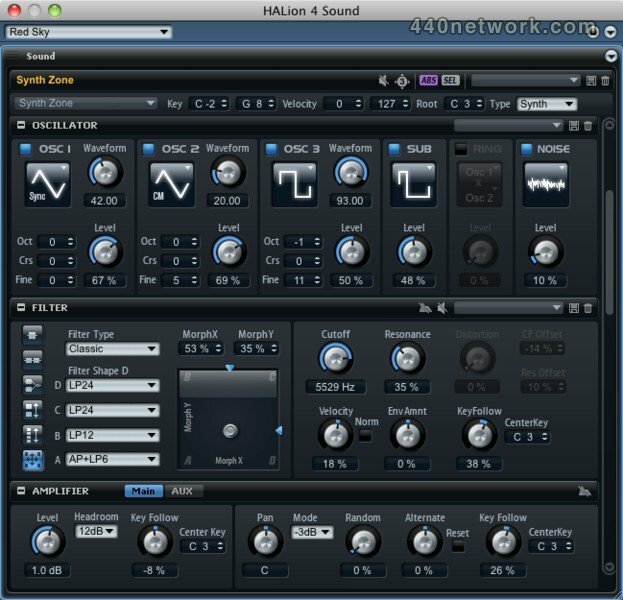 HALion 3.5 is available as a native 64-bit plug-in and should work in any VST 2.4 compatible native 64-bit sequencer, like Cubase 5 or Cubase Studio 5. The dramatically enhanced memory address space gives new possibilities for really large setups and very detailed sampled instruments. New entry available in the file menu: "Save as default Bank" allowing to save the current bank as default bank. New "Choose External Audio Editor" option in the global context menu to choose an external audio editor (like Wavelab or Soundforge). circumstances HALion 3.5 features more reliable play back of disk streamed voices. Due to several changes needed for 64-Bit compatibility projects created with HALion 3.5 can not be loaded with any prior version (of course you can load projects created with versions before in 3.5). For 32-Bit and OS X users it is recommended to continue using HALion 3.3.2, except you need compatibility to the HALion 3.5 64-Bit version. For example in dual boot configurations with 32/64-Bit Vista you need to install HALion 3.5 on the 32-Bit machine as well to keep compatibility between both. More practical numerical changes with mouse wheel for text edit. - When multiple Samples are dragged to virtual keyboard the root key is set correctly now. Content while loading other HSB Content. - Samples were sometimes not found. Fixed. - Reduced Drawing in Keyzone when selecting samples with the rubberband. User-Categories "Favourites 1-5" can now be renamed by keeping Ctrl pressed when selecting. Some Kurzweil CDs could lead to a crash. Fixed. New file browser with drag and drop support, favourites system, sound categorization and database indexing. An impressive set of powerful new sound management tools gives you a clear overview over all your sound files. The intuitive sound categories system lets you group related sounds, making it easy to find them quickly! new Insert and Send Effects section. 27 quality effects encompass just about any effect requirement. They can be applied to individual samples, sample groups or entire programs. Effect sends can be sent to HALion's internal FX section or even directly to the VST mixer to share plug-in resources between the host and HALion. HALion 3 now offers RAMSave , a new feature created to keep in check the RAM resources needed by even the most extensive sample instruments, resulting in low RAM usage and faster project load and save times, a boon for pro users using large, intricate sampled instruments such as big orchestral patches or large drum kits. Alternate mode - adds a range of functions, including playing a different sample with each new Note On message, introducing more spontaneity and feeling, especially useful for realistic drum-sounds or string bow up/down action. Even more file formats - HALion 3 adds support for Kurzweil and Kontakt sounds as well as for the Zero-X BeatCreator and BeatQuantizer Groove-Slice formats. You can find a 15 day limited Demo version of ZeroX BeatQuantizer in the 3rd party Demo folder on the DVD. Sleek and clean user interface: HALion explains its intuitive GUI with the new and improved ToolTip Help. Presets let you recall frequently used settings for envelopes, modulations and FX. Many views can be opened in separate windows.